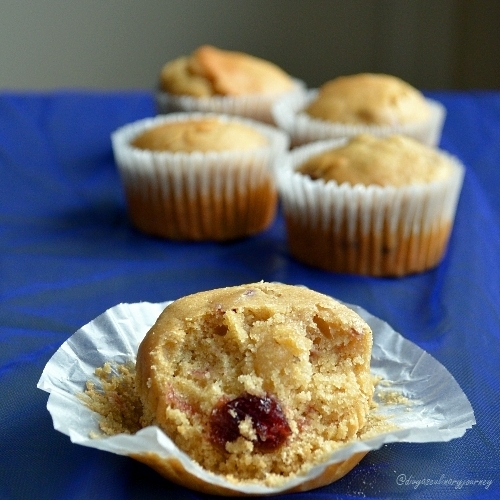 Today's recipe is Orange Cranberry Muffins. When I took up the theme Low calorie healthy breakfast for the blogging marathon I wanted to have atleast one baked breakfast recipe. So browsed and came across this recipe from Madhuram's Eggless Cooking. 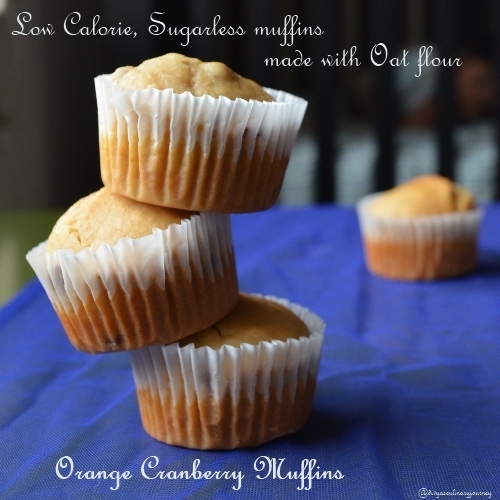 So did some minor changes to suit our taste and my kids loved this muffin and My hubby who is a health freak didn't have anything to complain. It is eggless, sugar less made with combination of oat flour, wheat flour and all purpose flour. Also it is low calorie. I replaced sugar from the original recipe to agave nectar, which has low glycemic index. 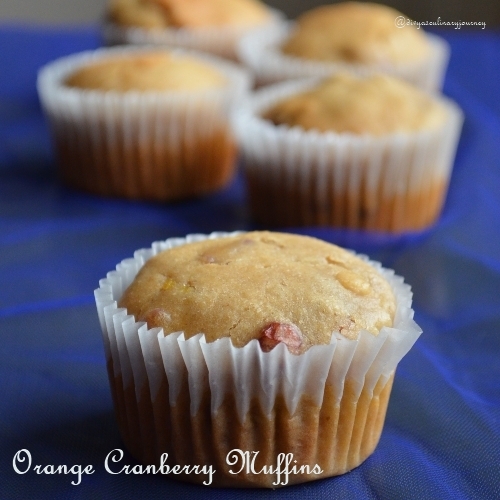 (It does not increase blood sugar level rapidly compared to consumption of normal sugar).This is a mildly sweet muffin and also the cranberries you get in each bite compliments the orange flavor. Pre- heat the oven to 350 F.
Prepare the muffin pan by greasing and flouring it or simply use the paper liner and set it aside. In a bowl, combine all the dry ingredients together. (flours, salt, baking soda and baking powder) Set them aside. In another bowl, combine the Nectar, oil and yogurt till they are well combined. Add this mixture to the flour mixture, alternating with milk to form a homogeneous mixture. Now fold in the cranberries, orange zest and orange juice till they are fully incorporated. If using, sprinkle oats on the top and bake for 18-20 minutes until the fork inserted comes out clean. The muffins taste better when it is completely cooled off compared to eaten warm. So wait till it is cooled completely. If you want, you can add some 1/4 cup of chopped walnuts to the batter. For the oat flour, if you have rolled oats or quick cooking oats, just powder them finely and use.You get it in the store too. But I just powdered the oats and used. 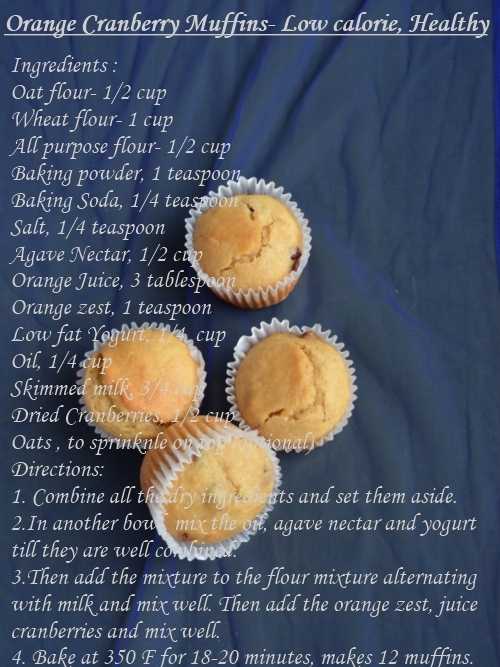 liked all your clicks divya.. never made muffins but will try it sure..
Lovely and healthy recipe and I like the second picture Divya...looks stunning. Perfect & healthy soft muffins. Great looking muffins! !liked the clicks..
very delicious n healthy muffins,great recipe with lovely pics...well presented too!! Muffins look soft and delicious. Awesome clicks and presentation. Looks so crumby and great..can do for a quick breakfast!